The Panama City Panama Temple is the 127th announced temple of The Church of Jesus Christ of Latter-day Saints. That announcement to build the Panama City Panama Temple came in August 2002. 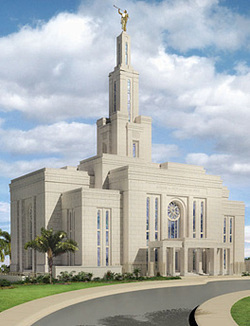 This would be the first Mormon temple to be built in the country of Panama. As of March 2006, there were more than 39,000 members of the Mormon Church in the country who, for many years, had sacrificed to attend the closest temple in Guatemala. Hurricane Beta lingered over the coasts of Panama and Costa Rica the day before the groundbreaking scheduled for October 30, 2005. But, by the next day it had moved north leaving a beautiful sky enjoyed by those in attendance. After the groundbreaking, presided over by Elder Spencer V. Jones, the construction of the temple officially began. The Panama City Panama Temple is located on a hill adjacent to a Church building and can visibly be seen by travelers from the canal and across the country. On the property of the temple, there will be offices and housing that will accommodate the temple presidency, temple missionaries, and members attending the temple. The Panama City Panama Temple is expected to be completed in June 2008. The Open House is scheduled for July 11 through July 26, 2008. Four dedicatory sessions are scheduled for August 11, 2008. The sessions will be broadcast to all stake centers in Panama.